He was responding to a question on Pakistan Prime Minister Shahid Khaqan Abbasi rejecting “independence” option on Kashmir. 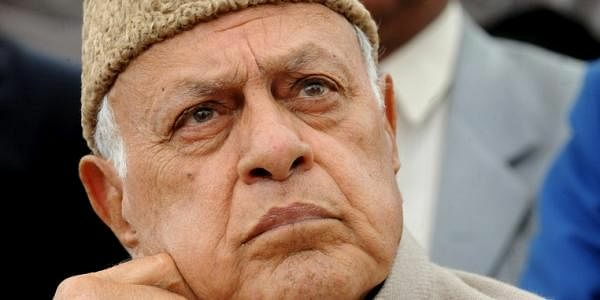 SRINAGAR: Opposition National Conference president and former J&K Chief Minister Farooq Abdullah on Saturday said “independent Kashmir” was not an option and claimed that Pakistan administered Kashmir (PaK) belongs to Pakistan and Jammu and Kashmir to India. “I don’t think independence or Azadi for Kashmir is an option,” Abdullah told reporters at the party headquarters, here today. Abdullah, who is also Srinagar MP, said Jammu and Kashmir is landlocked and “independent Kashmir” is not an option. “On one side, there is China, Pak is in another side and India is on the third side. All the three countries are nuclear powers and have atomic bombs. We have nothing except for Almighty Allah,” he said. In an indirect reference to separatists, Abdullah said those who are talking of Azadi are wrong. On statement by union minister Hansraj Ahir on PaK being part of India, he said the minister was right but forgets that Accession of J&K with Indian union was based on Instrument of Accession (IoA). “You tend to forget the IoA and say that PaK is our part. If you so that PaK is our part, then you should also talk of accession but you conveniently forget the three conditions under which Maharaja Hari Singh acceded to the Union of India,” Abdullah said. The former Chief Minister said he wants to make it clear to Indian people and world that PaK is a Pakistani territory and J&K belongs to India. “The status won’t change even if they fight unlimited wars. It would not change,” he asserted. Abdullah said India and Pakistan would have to talk so that people on both sides of dividing line live in peace. “It is must that PaK is given autonomy and same should be the case with this part of Kashmir,” he said. Alleging that New Delhi betrayed Kashmiris, Abdullah said, “India didn’t treat us well. It didn’t recognize the love with which we chose to join India. Governments at the centre have never been sincere with Kashmir and its leadership. We have always been forthcoming with them but India betrayed us and our trust. It is the reason behind the current situation in Kashmir”. He said restoration of internal autonomy to J&K was the only viable solution to decades-old Kashmir problem. “It is our right and it should be restored so that peace returns in the State”. Asked whether the visit of interlocutor Dineshwar Sharma to the state was successful, Abdullah said only Sharma can answer it. "I can only say that while he has held talks, only talks between people of J&K and New Delhi will not address the issue. This is the issue between India and Pakistan,” he said adding, “India will also have to talk to Pakistan because part of Kashmir is also with them”.